One of the most common plumbing problems for any home owner is a clogged drain. Although some drains are easily taken care of, many will resist amateur efforts to fix the slow or stopped drainage. For those in need, our drain cleaning is just a phone call away. We have decades of experience cleaning drains. A clogged drain does more than just a nuisance. What might seem like a stagnant sink or a slowly draining shower might indicate serious problems lying within the interior of the plumbing system. Don't let pipes burst or a basement flood because it seemed like the problem could wait: call in a pro to help unclog drains. Although some clogs are easily fixed, big jobs should always be left to a professional. Complicated unclogging tools can cause more than just damage to the home: they can cause serious physical harm to those who don't understand how to use them. We are experienced tradesmen and have the skill to ensure that a job is done safely and correctly, ensuring that no damage is done to the home. 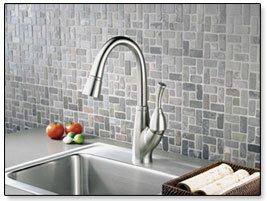 Most drain cleaning is done in one of two ways: either with a plumber's snake or a high pressure blast of water. A plumber's snake is a solid coil that can be manually used to unclog drains. The operator will turn a crank which will spin a device at the end of the cable. This will help scrape or otherwise dislodge clogs. High pressure water will help clean pipes and blast through whatever matter is causing the clog. This is less common in households but it is sometimes necessary. A representative will describe whatever process they plan to use to solve your drainage problem with you before beginning. Drain cleaning is one of the most important aspects of home maintenance. A clogged drain not only causes annoying water back up, but can also cause a variety of other problems. Sitting water can result in a number of different health and safety issues that can plague a family. In addition, water that is slow to drain can causes permanent damage to home fixtures. We can help you get your drains back under control. If you're suffering from slow or stopped drains, the best way to get your life back to normal and prevent any serious damage is to call in a plumber. We have been in the business for years. Hiring only the best and brightest, customers can expect quick, friendly service at a reasonable price. Don't hesitate - call today!